Looking for a good car seat to put your child in when riding your car might be a hard choice as there are many different good and bad brands in the market. Safety 1st Complete Air 65 Protect convertible car seat is however, one of the best convertible car seats in the market. Its side impact properties together with how compatible it is to many different children makes it to be one of the sought after car seats around. It comes in both front-facing and rear-facing variation. The 5 point adjustable headrest is a great feature for your growing child and installation of this car seat is very easy. 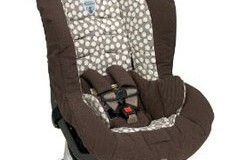 This car seat is also a winner of SheKnows Parenting Award and Editor’s Choice Award for 2011. Being a new car seat model from Safety, it is definitely an improvement from the older version of the car seat. This new version car seat can hold a young child of 5-40 pounds of weight in the rear facing position for longer than its earlier version. The newer Complete Air 65 has a larger carrying capacity than its predecessor and can now carry a child ranging between 22-65 pounds. Its 5 point adjustable harness has definitely been made stronger and can support a child weighing at 65 pounds. 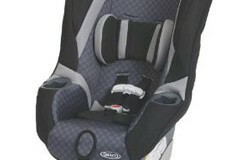 Its Air protect features are what make this car seat stand out above the rest. It has been installed with an instant air release mechanism that protects the child in case of an accident. The release of air helps to cushion the child from impact thus reducing the chance of the child being harmed. You can easily adjust the car seat by three different recline positions thus you wouldn’t have to adjust the front seat which it is leaning on when it is on the rear facing position. Each car seat comes with a detachable cup holder where you would keep the baby’s bottles. The seat comes with an easy to understand harness system that is connected to the heads rest. You can easily adjust the harness height by moving the child’s head rest, all which can be done from the front thus reducing you the stress of having to remove the car seat to adjust the harness. The harness can also be adjusted in 5 different positions to fit any child and also accommodate your child when he/she grows. 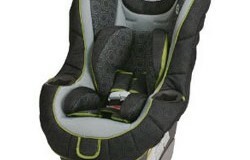 The car seat is equipped with latches to safeguard it from getting out of position when the car is in motion. It seat pad is washable making taking care of the seat much easier. Its air protection property is definitely its best safety feature. Safety has crash test this car seat using dummies of the same height as babies and the seat has passed all safety air release tests. The air releases in the head rest cushion the baby by absorbing the shock from the impact thus protecting your baby in case of an accident. The increase in weight tolerance capacity in its harness has made it safeguard your baby from being ejected out of the seat in case of an accident. The harness can now withstand your child’s weight to up to 65 pounds when he/she grows thus protecting them even more. It is easy to install and to adjust the seat in any position for instructions are quite basic thus eliminating the chance of guesswork when installing the seat. As the seat’s head rest is adjustable, it acts as head support for your child thus giving him/her a comfortable ride without tiring his/her neck. 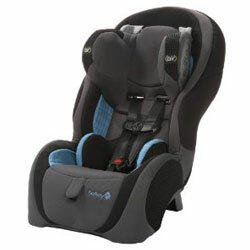 If you want to safeguard your child’s ride in the car then Safety 1st Complete Air 65 Protect convertible car seat is the car seat for you for it will not only make the car ride safe for him/her it will also be a comfortable ride for both him and you as he might be too comfortable to stay awake the whole ride. Summary : A very good product for the given price. TotOnBoard.com is a participant in the Amazon Services LLC Associates Program, an affiliate advertising program designed to provide a means for sites to earn advertising fees by advertising and linking to Amazon.com. Certain content that appears on this website comes from Amazon.com. This content is provided 'as is' and is subject to change or removal at any time without prior notice.